Before recording, you need make sure Power Mp3 Recorder knows what you want to record, you can record from microphone or line-in jack of your computer, for Windows XP, you can even record what's playing on your computer, this section introduce how to choose between them. 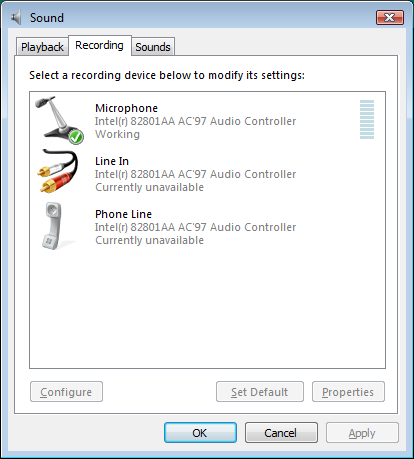 Connect your microphone or audio source to the microphone or line-in jack of your computer. Click "option" button of the main form, from the recording device list, choose the sound source you want. For more information of sound source, you can right click on the audio icon from the windows system tray area. 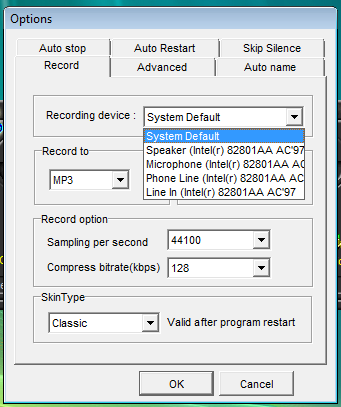 After click "Recording Devices", following dialog will show up, from here you can choose the default device, which will be used as "system default" setting of Power MP3 Recorder.